(Crow-Loo-Ska). Deluxe 100% neutral spirit distilled from grain alcohol, which is highly refined, and used to produce Krolewska. The production process starts from the grain selection - grains are taken from the ecologically cleanest areas in Poland, before bottles are filled with the vodka, it undergoes a multisage filtration and, an effect of which, it gets the crystal transparency. The royalty of this vodka is also underlined via the image of the package - a satin bottle of a slender shape with the stained glass window from Mariacki Church in Cracow. 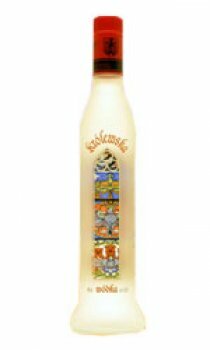 Vodka Krolewska was produced in the Polmos Distillery in Zielona Gora in 1994 for the first time. Since thae it occupies the top shelves in all the exclusive shops. It is the product of the premium class. As the name indicates, we deal here with the uncommon product as far as the drink and package are concerned.